Deathbroker begins automatically after speaking to Krillo and completing Cat and Mouse. With the help of companions both old and new, the player discovers the source of the contracted killers and delves deeper into the intrigue of the Darksteels. Following Krillo’s tip, the player heads to Windhelm to reunite with the former Knight of Thorns. Erevan can be found sitting in the back rows of the Temple of Talos in Windhelm, quietly listening to the mournful tune sung by a young woman kneeling at the shrine. As the player approaches Erevan, he nostalgically reflects upon similar experiences of listening to the hymns in Cyrodiil, evident that he has learned to move on from his past. With a sense of admiration, he tells the player the young singer at the alter has lost many loved ones in the past year, but despite these tragedies continued to move forward while shouldering the heavy burdens with grace. Speak to Erevan to learn that while investigating the murder of a dunmer, he too became caught up in the growing intrigue. He observes that those who grew impatient with the Dark Sacrament have taken up hiring independent contractors to carry out assassinations. Where supply rises to meet demand, a powerful broker began collecting and distributing these individual bounties in an organized fashion. Erevan’s search eventually led him to the Darksteels, and to Krillo in Markarth, who once saved the Knight of Thorns from a mob of bandits and his own self-destructive disposition. Erevan believes that he is close to finding the supplier of the contracted assassins – the deathbroker. When she is finished with her prayer, the young singer will approach and converse with Erevan, the two evidently have established a sort of friendship. Introducing herself as Alassea, she quickly befriends the player. As a natural extrovert, she invites both Erevan and the player to her aunt Viola’s party where she will be performing. The player can accept or decline, either way, she will insist that they both go and leaves to prepare. Erevan divulges that the possible crime boss may be one of the guests to Viola’s party and suggests the player to attend in order to investigate. He hands the player a letter Krillo had given him, supposedly originating from the broker to Maven Black-Briar, containing dates and other clues that can be used when questioning the party guests. Meet Erevan at Viola’s house when ready. The party will already be underway and the guests scattered around the first floor. The player may feel free to eat, drink and mingle. Entertainment of the night is provided by Alassea, who will take song requests as well. There are three main suspects the player may speak with. Make small talk with Bettany, Grenier, and Roggstad to gain some insight into their background and personalities. The player may also speak with Alassea who offers tidbits on the three suspects, or if one simply wish to learn more about Alassea herself. Using clues from the stolen correspondence and interaction with the party guests, narrow down to one suspect. When ready, speak to Erevan to inform him of the identity of the suspect. Regardless of who the player ends up accusing, Erevan will voice some sort of agreement. He asks the player to tail the suspect in order to obtain more evidence, while he intends to go speak with the Steward, designating the Cornerclub as a rendezvous point after finishing these respective tasks. This triggers the next stage of the quest and the party disperses. Follow any one of the suspects as the guests head out of Viola’s house. Either pickpocket or kill the suspects to obtain the journals on their person that will confirm the identity of the broker. With the correct evidence in hand, head to the Cornerclub as agreed to meet Erevan. Entering the Cornerclub, the player find Erevan to be nowhere in sight. The player can wait as long as patience permits, the knight will not show up. 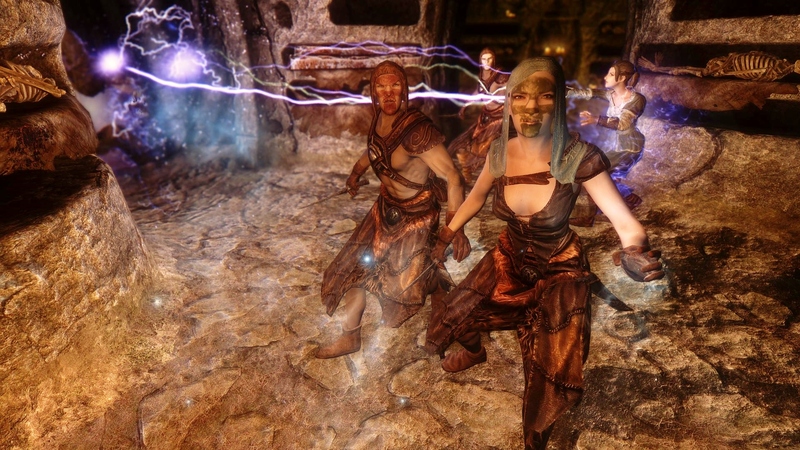 Idling being outside of the Dragonborn’s nature, leaving the Cornerclub will trigger an encounter with a courier who delivers an anonymous letter requesting the player to meet at the Hall of the Dead where they first met. With Erevan being temporarily preoccupied, the player should go directly to the Hall of the Dead in Windhelm to meet with this secret admirer. Upon entering the main chamber of the catacombs, the eerie voice of Deneris echos to greet the player. Revealing his ambush, a ghostly Deneris emerge from the caverns to accost the player while his followers stalks out of the shadows. Clearly still bitter from the events of long past, Deneris disclose that the relic which triggered the series of betrayals was a tributary sword from the Ashlanders to the daedric trinity: Boethiah, Mephala, and Azura. Deneris claims the relic itself was never the true objective, but a test of Varyan’s loyalty, pitting his allegiance to Deneris against that of the Ashlanders and the Trinity. Despite siding with the Trinity initially by defying Deneris, Varyan nevertheless incurred the wrath of the deadra when he let Deneris live. The vengeful gods struck a bargain with Deneris – Boethiah granted him immortality, like a living daedric weapon, they allowed him to kill Varyan for his betrayals. However, the Trinity promised they would ultimately take Deneris’ life as well. Finally, claiming that the player have been guided by aspects of the daedric princes to kill him, he attacks. Proceed to dispatch Deneris and his goons in the usual Dragonborn fashion. Although the player may be flying solo at this point, Alassea will appear in the middle of the fight to lend some sparks, being a trained mage. Deneris’ voice can still be heard after the player defeats him, declaring that he cannot be killed and will return. Alassea expresses her concern after the fight ends, admitting to having followed the player out of curiosity. While discussing with Alassea what to do with the new bodies added to the Hall of the Dead, Erevan rejoins the party. Regrouped, the heroes now realizes they face the unusual conundrum of killing a ghost. Beginning to put together the pieces, the player informs Erevan that Deneris mentioned an aspect of Azura they have yet to meet, as well as the identity of the broker and the assassins’ base of operations in a cavern called Robber’s Refuge in The Rift. Following these leads, Erevan suggests to pursue both the Shrine of Azura as well as Robber’s Refuge. Alassea, her sense of adventure brimming, declares that she will go along as well, despite Erevan’s chivalrous protest. This progresses the current questline to the next stage as well as triggering a new side-quest – Robber’s Refuge (see separate quest page). The player can proceed to the two locations in either order. However, only going to the Shrine of Azura will continue Deathbroker, whereas reaching a certain stage of Robber’s Refuge is necessary in the subsequent quest. Upon arrival to the Shrine of Azura, the trio is met with a new pilgrim, Erwen. 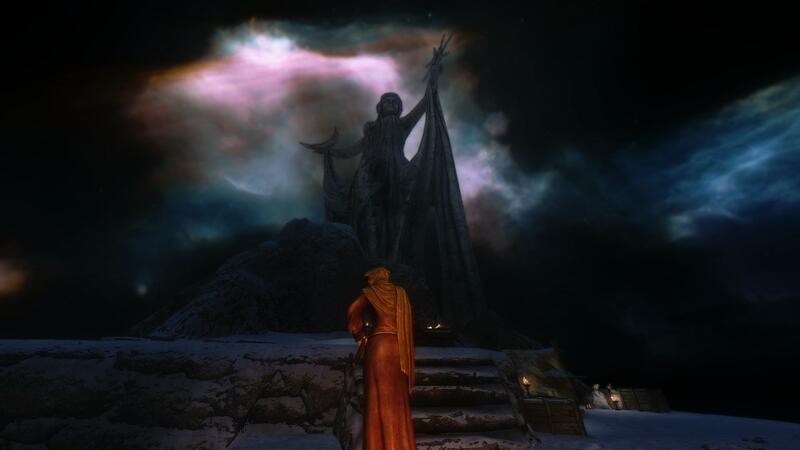 She comments on the beauty of the shrine in awe, recalling Elandir had called the shrine evil. Through Erwen’s dialogue, the player learns that she is a descendent of Elandir and Gildi, both were former Darksteels. Elandir eventually deserted the order and abandoned the brotherhood as well as Gildi. Erwen is familiar with the history of Darksteels through Elandir’s writing, but gave most of his works to Lorne. When questioned about the sword relic, she explains it is the Trinity Blade, capable of banishing spirits from the mortal plane. She is unable to provide the location of the sword, but gives the player the last of Elandir’s writing in her possession, conjecturing that the player may be the one to find the blade and slay Deneris. With her parting words, Erwen enigmatically relays Elandir’s warning that when dealing with the Daedra, all roads are paved with bones. The conclusion of this exchange completes Deathbroker and starts the next quest in the series – A Path of Bones. Stages 6, 10, 14, 15, 20, 21, 30, 39, 45, 51, 52, 55, 61, 62, 63, 64, 65, 70, 90, 100 are scenes and triggers used to progress the quest.